Isabelle d’Este, daughter of the Duke of Ferrara, born into privilege and the political and artistic turbulence of Renaissance Italy, is a stunning black-eyed blond and an art lover and collector. Worldly and ambitious, she has never envied her less attractive sister, the spirited but naïve Beatrice, until, by a quirk of fate, Beatrice is betrothed to the future Duke of Milan. Although he is more than twice their age, openly lives with his mistress, and is reputedly trying to eliminate the current duke by nefarious means, Ludovico Sforza is Isabella’s match in intellect and passion for all things of beauty. Only he would allow her to fulfill her destiny: to reign over one of the world’s most powerful and enlightened realms and be immortalized in oil by the genius Leonardo da Vinci. Isabella vows that she will not rest until she wins her true fate, and the two sisters compete for supremacy in the illustrious courts of Europe. 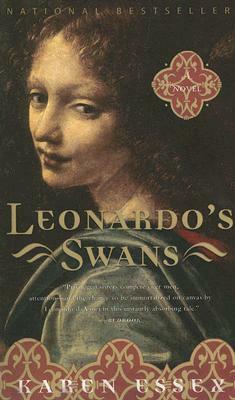 A haunting novel of rivalry, love, and betrayal that transports you back to Renaissance Italy, Leonardo’s Swans will have you dashing to the works of the great master—not for clues to a mystery but to contemplate the secrets of the human heart. karen essex is an award-winning journalist, a screenwriter, and the author of two acclaimed biographical novels, Kleopatra and Pharaoh.